grated, you’ll never go back to pre-grated. Just as freshly-ground pepper bears no resemblance to the bland, pre-ground powder, freshly-ground nutmeg is a vibrant spice that perks up sweet and savory dishes alike. We use it to flavor apples and other seasonal fruits (pies, compotes, sautéed sliced fruit), to make cookies and pastries and in custards. We love it in egg dishes and vegetable purées. It’s our favorite seasoning with spinach in any form, and on pasta with broccoli rabe. For beverages, use it in addition to (or instead of) cinnamon on hot chocolate, coffee, cappuccino, mulled cider, warm milk, cold milk, chocolate milk and of course, eggnog! While some cooks grate the whole nutmeg against a fine plane kitchen grater, we value our skin and use a nutmeg grinder or mill—the same principle as a peppermill, but accommodating the larger nutmeg, which is the size of an unshelled hazelnut. 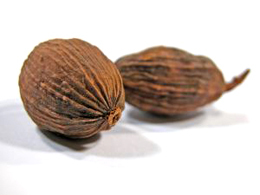 The nutmeg is the seed of an evergreen tree fruit. The tree, botanically known as Myristica fragrans, is indigenous to tropical southeast Asia and Australasia. Mace is the milder-tasting dried hull of the nutmeg—the part you peel off to get to the nut.